Halloween is just creeping around the corner, if you are the guys who like scaring people, you must have been thinking which Halloween costumes you should wear, maybe Groot, Maleficent, or other nice characters. When you are celebrating your Halloween, your iPhone is also doing the same thing. In other words, there is the possibility that your iPhone is haunted! Here we collect 6 signs that can tell if your iPhone is haunted. When I opened the package. Instead, there was a blurry image of Steve Jobs burned into it. At first I didn't recognize it at all, my brother told me he was sure it was Steve Jobs. 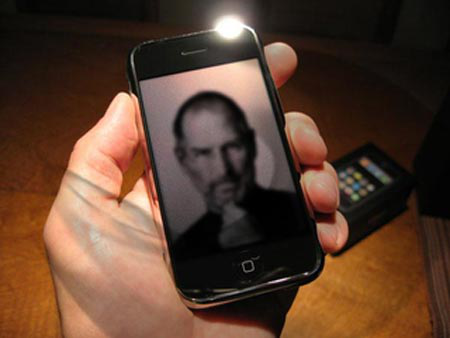 We looked through some pictures online and we are pretty sure the image is that of Steve Jobs. I tried to rub it off thinking it was a joke, but the screen was SUPER HOT. I pretty much burned my fingers and as I type this, the middle and ring fingers on my right hand barely feel the keys on this keyboard. Never ever touch the screen of this ipod. The sides are cool room temperature, but the screen is intensely hot. Steve Jobs just laughs at me. Over and over and over. I've had it for a day and it hasn't run out of batteries. The sound still works. It laughs while I sleep. It laughs at me in the car. At work. Everywhere. I was going to return it, but maybe someone is interested in this haunted piece of technology. If you find that your iPhone always keep pausing and playing music, or speeding it up to x 2 when you play music to go to sleep in the night. Sometime, it even plays some songs you don't have and shows you album picture when you listening to music with iPod feature. You never thought that when you have fallen into sleep or be busy with something without any time spending on iPhone, your iPhone has its own thinking. It texts messages to your friend, or gives calls to your boss and colleagues, even if it is locked at that time. A user from Yahoo answer says that, his iPhone called his big boss at 2 am, and he answered, and then the user don't know how to explain that his iPhone made this call on its own. If you can stand your iPhone text messages or dial calls as it wants, but I don't believe you can bear that it text or dial to an international number. This means you have to pay for the bill it made. You are watching a YouTube video or playing a game on your iPhone, and the Siri keeps popping up, and talking to you. Without any doubt some demon has controlled your iPhone, and your iPhone is haunted! Sometimes, the photos of your iPhone may act wired in some unexpected way. When you went to view the photos in thumbnails they were there but when you tried to select them the photo pulled them up white. Or when you shot pictures they sometimes change to other pictures that were deleted. What's more horrible, when you take pictures the iPhone removes people's faces from images. Without incoming messages, alerts, alarms or anything else happening to your iPhone, but it jumps off the place where you put your iPhone there. For instance, you place your iPhone in a decorative box on a table, but it jumps off of the box and falls to the ground, or you place your iPhone at bedside desk at night and then find it under your bed in next morning, and you are sure you haven't touched it at all during the whole night. If you are witness to your iPhone's odd things like any above, we can tell you for certain that your iPhone is haunted! To unhuant your iPhone with iMobie's secret weapons, and play the Trick or Tweet game to win the $500 iTunes Gift Cards. By the way, when you are enjoying the Retweet contest, don't forget to share this article to help your family or friends tell if their iPhone is haunted!